All players must be 18 years or older to play on Tuesdays and Wednesdays. Friday leagues begin in January; Sunday leagues begin in January and in May. Please understand that one or more games could be played on a spillover day, likely a Thursday evening, to accomidate team scheduling requests. When possible, these are booked mid-way or late in the schedule. If you currently have a Player Pass and are registered, you are now a LIFETIME MEMBER of Epic Center, and you'll never have to buy a Player Pass again. If you currently don't have a Player Pass and registration with Epic Center, you need to pay a one-time fee of $20 at the front counter before your first game. You will be required to submit photo ID and sign a registration/waiver. Players under 18 years old need to have a parent/ guardian over the age of 21 to sign the documentation. ALL PLAYERS MUST PROVIDE VALID PHOTO ID TO BE REGISTERED TO A TEAM. All players must register with S.O.D.A. Insurance (Sports Operators & Developers Association), and maintain currently valid insurance session to session. Insurance runs by calendar year, and must be purchased again before the New Year. It is a $30 annual fee payable to Epic Center. Epic Center can provide additional information regarding coverage if you inquire at the front desk. Insurance may only be purchased in-person at Epic Center. Please read, print, complete, and mail our Inline Hockey Registration Form with your payment. Additonally, please complete the Roster/Waiver. Last, ensure you're familiar with the AAU Rulebook and our additional House Rules. Dates below reflect session start weeks facility-wide, not neccessarily exact start dates. Start and End Weeks may fluctuate as teams register. ^Team fee does not include ref fees. Ref fees are $25 per game. Any team that forfeits must pay for both teams' ref fees, $50 due before your next game. #Due to scheduling around the busy holiday season, we have reduced the number of games and cost of the second session. Single Elimination playoff format-- even the lowest ranked team in league play can still win the Championship! The rink now rents for $100 per hour, as scheduling permits. This reduced fee only applies to current players who are properly registered with S.O.D.A. Insurance and the LIFETIME MEMBERSHIP at Epic Center. Further, you may book the rink as a current player, and still invite players who don't neccessarily have registration with Epic Center. As long as the individual booking the time is a current registered player, everyone else is welcome to play. All patrons must be in good-standing with the facility and management. Athletica Sport Systems will have a BRAND NEW rink professionally installed at Epic Center for the September 2018 session. Players, THANK YOU for 22+ years of business here at Epic Center; we are proud to continue to invest back in the Roller Hockey community around Western New York. In addition, we have lowered all league fees and added games to all sessions. Please continue reading for all the details below and please read the front and back of the registration form linked above! In general, the Epic Center follows the rules set by the AAU Rulebook, with an addition of some House Rules which superscede some AAU Rules. League Directors will have the final say regarding forfeits, late/early starts, and other administrative policies. Teams may have up to 18 players on their roster. Play is 5 on 5 for two 22-minute halves, which includes 4 skaters and 1 goalie. There is a 5 minute warm-up period. All games will be played using a puck and a two-referee system. Ties in regular season go to a 3 minute overtime, then sudden death shootout. Ties in playoffs go to sudden death overtime. 3 points for a regulation win. 0 points for regulation loss. 2 points for OT/shootout win. 1 point for OT/shootout loss. Any pucks that hit the outside netting and return to play will result in play resuming and not resulting in a face-off. Pucks that get caught in netting and don't come down will result in a face-off. League Champions are recognized on our brand new Trophy and receive T-shirts. Team picture is emailed to the team captain post-game and goes on our Wall of Champions. The Top Goal Scorer, Top Playmaker, and Top Goalie of each division receive a custom made plaque with their photo, name, and session stats engraved on it. The Epic Sports Center requires any players under 18 to wear a full cage shield. However, we recommend that everyone wear a full cage. All players must have a numbered jersey, and must have skates with no missing wheels. All players in our Adult leagues must be 18 years or older; with exceptions approved by Epic Center, 17 year olds must have a parent sign all registration documents. All team captains must be 21 years or older. All players or coaches in the bench area must be properly registered with documents from the league administration. Epic Center offers non-checking leagues; no fighting or rough play is allowed. Players receiving three (3) penalties in a game will be pulled from playing. In general, any player receiving three (3) penalties will also receive a game suspension and a $50 fine. Depending on the circumstances, Epic Center may rule a more or less severe suspension and fine. Captains are expected to tell their teammates all Epic Center rules and procedures. All players must wear certified hockey helmets. All players 17 and under must have a mouth guard. All players 17 and under must have a certified full cage or shield. All players must have chin strap fastened properly. All players must have SODA insurance. All players must be properly registered with a valid Epic Center Player Pass. This pass requires photo identification and is not a form or proof of S.O.D.A. insurance. Must be purchased at front counter prior to first game. Insurance- $30- valid January 1st through December 31st of 2018. Pass- One time fee of $20, or waived as of September 2016, if you currently have one at Epic. All players must sign the roster/waiver; due and frozen by the third game of the session. 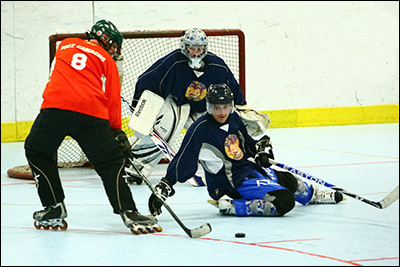 All players must wear elbow pads, hockey gloves, knee and shin guards (one piece), and inline hockey pants. Sweats and hockey hose may be worn, but are not recommended. Players may not wear shorts. Must have three to five wheels, depending on the skate. No skater or goalie may play with wheels missing from their skate's chasis. Any player infracting this rule will be pulled from participation. No plastic sticks or blades permitted. No blade may be used if it is worn to a point or is less than one inch in height. All team members must have same colored jerseys. All players must have different numbered jerseys from 0-99. Rescheduling must be done within the first two weeks of the session. Any rescheduling done after the second week must be approved by the owner and a $20.00 administration fee must be paid. Any team that forfeits must pay for both teams' ref fees, $50 due before your next game.